Conimbriga - A Roman Settlement or is it Much More Ancient? All across Europe, we can find countless Roman settlements allegedly built by Romans. For example, there are the Ruins of Conimbriga, believed to have been built by the Romans – but new research shows why that is unlikely. Fig. 1: A detail of Conimbriga: Did you notice the new stone layers on top of the older stone layers? They are not of the same kind. The Roman stones are significantly smaller. Did you also notice the massive blocks underneath the base of the arch on the right? This suggests that the site was renovated by Romans, right on top of older foundations, similar what we see in many other Roman settlements, such as Baalbek. Notice also that this part of the foundations is much deeper situated than what we see at the back of the site in this photo. The site consists of multiple layers of antiquity. The Romans used the ancient ruins to erect their new settlements upon and then they claimed it all as their own. Wikipedia says about these ancient ruins: “Like many archaeological sites, Conímbriga [was] evolved sequentially and built up by successive layers, with the primary period of occupation beginning in the 9th century; during this period the area was occupied by a Castro culture.” In fact, this phrase says what really happened with Conímbriga: evolved sequentially and built up by successive layers. That is what this very ancient site is all about but on a much more ancient scale than anyone could previously imagine. Why do we have to excavate something that is only about 2,000 years ago? Most people think that 2,000 years is old because they cannot comprehend “age” much beyond their own limited lifespan. They tend to think 2,000 is very ancient, and therefore excavation sounds valid. Yet, it is not plausible, because most people, even archaeologists, have no idea how soil builds up over time. The average rate for soil to build up in the region around the Mediterranean is not more than 1 inch per 1,000 years. Hence, an alleged Roman settlement, which has been excavated from a depth of some 10 feet (3 meters), is considerably older than 100,000 years. Fig. 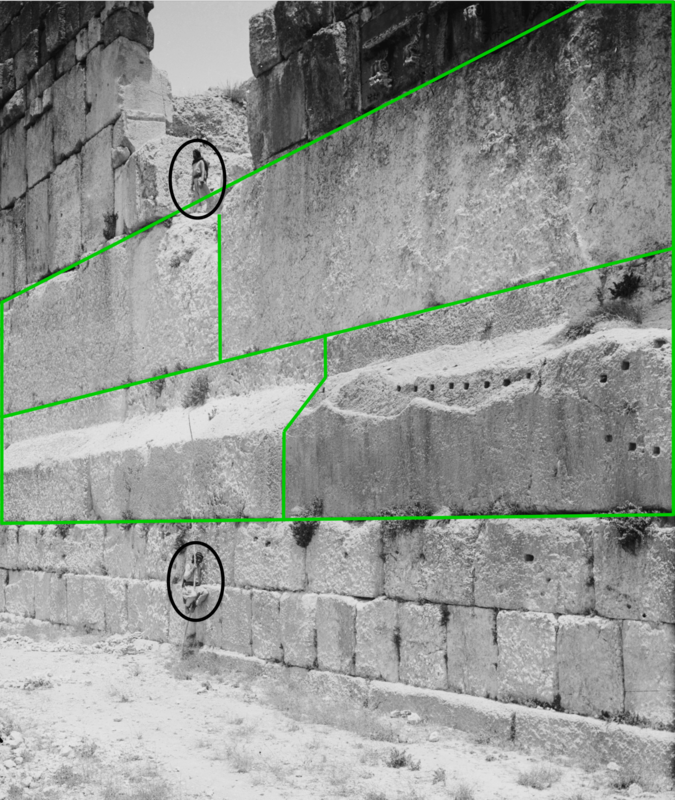 2: The stone blocks marked with green lines are definitely not placed by the Roman empire, because they had not the ability to handle this size of blocks, not even by a factor of 100! The Romans renovated their temples on top of much older foundations, which were originally placed there by a highly advanced pre-ice age civilization, capable of handling such massive blocks. The orientation of Baalbek suggests this civilization was surprised by the last deformation cycle, hence the unfinished state of this structure. Baalbek is dated by us at an age of 125,000 years old. The temple was built during a period when the crust already was unstable. But it is well known that the Romans never had the ability to lift Stones as heavy as those that can be found in the foundations and walls of Baalbek. Sometimes they exceed 1,000 tonnes! The Romans could lift only a maximum of about 6 tonnes, while their average lift capability was around 2 tonnes. Why would the Roman empire built in the middle of nowhere, in one of their occupied territories, one of the grandest temples they had ever built, using stones far above their ability to handle? The fact is, they did not. They hijacked a much older culture, burnt their records, and persecuted and killed their intelligentsia, and claimed their ancient structures as their own. Contemporary dictators behave in a similar fashion. Why does UNESCO ignore these simple and obvious facts? Because their paradigm prevents them to even consider the real facts – the truth – and this truth is unbelievably simple and incredibly obvious at the same time. Humans, in their present form, have walked the face of this Earth for more than 400,000 years, and they have been continuously active all this time. The massive structures they left behind – all over the world – are a mute testimony to this fact. However, several extinction events such as natural catastrophes of biblical proportions have repeatedly wiped out these ‘lost civilizations’, leaving us amazed at what remains of their magnificent structures. How Old are Ground Layers? Fig. 3: This recent dig on the site of Chichen Itza reveal older but similarly-oriented foundations. 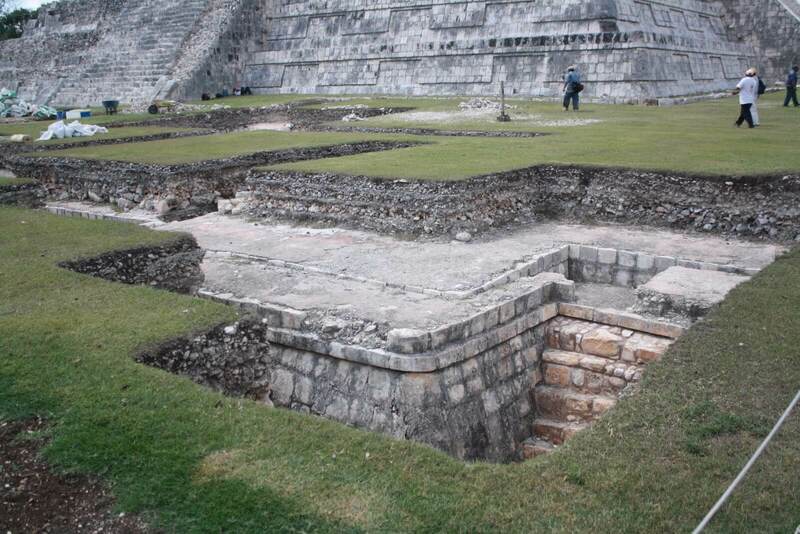 With our method, we have discovered that these platforms beneath the ground level belong to the same era as those above the ground situated at the pyramid of Kukulkan. The only difference is that this pyramid has been renovated countless times by successive cultures, while its orientation remained unchanged. The foundations of the pyramid of Kukulkan are between 240,000 and 270,000 years old. Chronostratigraphy is the branch of stratigraphy that studies the age of rock strata in relation to time. It can tell us something about the age of a construction relative to the depth of its foundation. For example, if we must dig up the ground floors of an ancient building somewhere between 20 and 30 feet (6 to 9 meters) deep, how old could that structure be? It depends on the type of soil. For example, if you investigate the depth-time relation of an average peatland, you will have to dig down to a depth of about 10 feet (3m) to find the remains of human existence going back about 5,000 years. The deeper you go, the firmer the ground becomes and the longer it takes for compression to manifest. In the same peatlands, you will have to dig down 20 feet (6m) to find the remains of an age of about 25,000 years. It shows how soil compression proceeds. Note that you cannot draw reliable and specific conclusions from this example, but it provides some indications. It also gives us confirmations of what we already know from the orientation patterns. Fig. 4: Few people know that Teotihuacan was covered with a thick layer of sediments, while archaeologists tell us it is 1800 years old. If that were true, the site would be covered with only a few inches of soil. 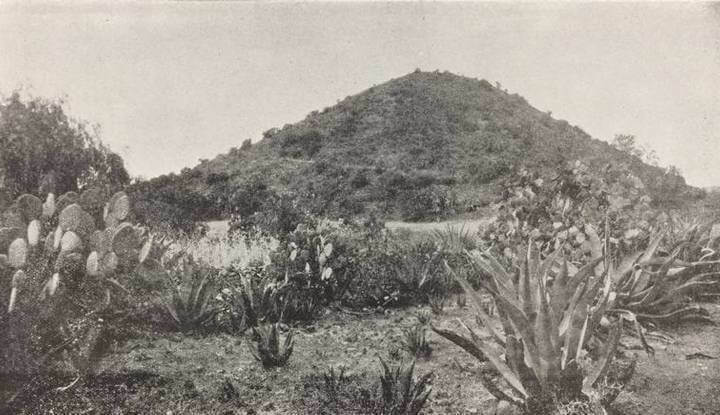 It took 75 years to remove all the soil and to restore Teotihuacan to how it looks today. If we do the same in more solid, rocky terrain without much vegetation you will see that at the same depth of about 10 feet (3m), things are much older. At 10 feet (3m) depth, these sediments can easily be 300,000 years old. From the mainstream paradigm point of view, it would be a problem when we find ancient constructions or artifacts at a depth of many feet (m), in that kind of soil. Geologists are not funded to provide evaluations which could harm the paradigm of archaeology. If we look around the world, at the countless ancient structures which have been excavated, we see that most ancient structures had to be excavated from layers which are many hundreds of thousands of years old. Is Our Ancient History Falsified? Across Europe, numerous Roman settlements can be found. 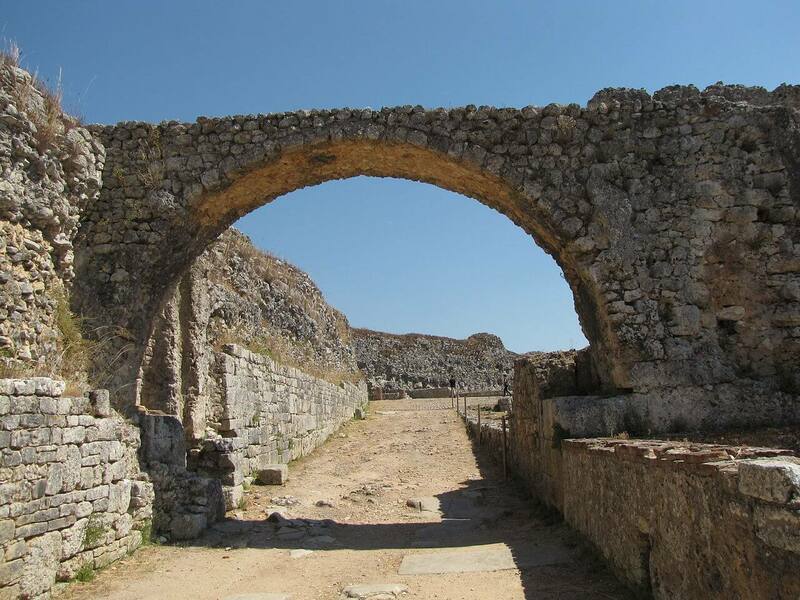 For example, the Ruins of Conimbriga. According to historians, they had been built by the Romans. But new research shows why that is impossible. This new research shows clearly that the Roman era simply overtook much older cultures, destroyed its values and claimed the remains as their own. It seems that the Romans were guilty of one of the largest fabrications and falsifications in history. We see quite clearly that the rise and fall of the Roman empire, the successive rise of the sheer unlimited power of the Vatican, and the falsification of our history on a grand scale, are all related. Let us not forget the Spanish conquistadors who, under the flag of the same Catholic church, destroyed the entire cultures of the Mayans, Aztecs, and Incas in Latin America. These were not some minor raids; these were large-scale, well-organized invasions to destroy and cover up ancient history as completely as possible. Fig. 5: The Rock Wall at Rockwall in Texas. This part of the wall is only the upper part, other parts are much deeper. It is easy to understand that this ancient wall is much older than 100,000 years. Archaeology has never attempted to investigate this ancient structure simply because their paradigm does not fund this kind of work. Take for example the Rock Wall at Rockwall in Texas. Most Americans have never heard of this very ancient wall, although it should take a whole chapter in our history books. But that would destroy much of the established carefully defended paradigms. 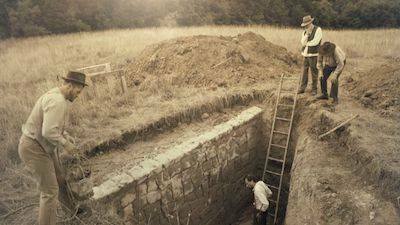 Parts of the Rock Wall had to be dug up from a depth ranging from 10 up to 40 feet (3 to 12m). It was discovered by accident in the middle of the 19th century. Even today there is not much knowledge about this wall. The depth at which the wall was found indicates that it is much older than 100,000 years. From the orientation patterns of the upper parts of this ancient construction, we can conclude it is at least between 240,000 and 270,000 years old. The deeper parts are probably much older, but we have no information about these yet. Note also, that all findings of this age are beyond the sphere of application for the 14C method. The paradigm Stone age, Bronze age, and Iron age – an idea for which no one seems to be responsible – do not yet accept or allow a sophisticated and highly organized society beyond an age of 100,000 years. This paradigm is heavily defended by Academia. Fig. 6: The Earth’s crust was deformed due to an oscillating force which was generated by a highly eccentric orbit of the Earth around the Sun. Four former poles are mathematically proven. For example, Pole II has a probability of 1 to 1.79×1018. Of all other possibilities, Conimbriga correlates with this pattern. It also suggests that Conimbriga has been reoriented, but can we prove that? Fig. 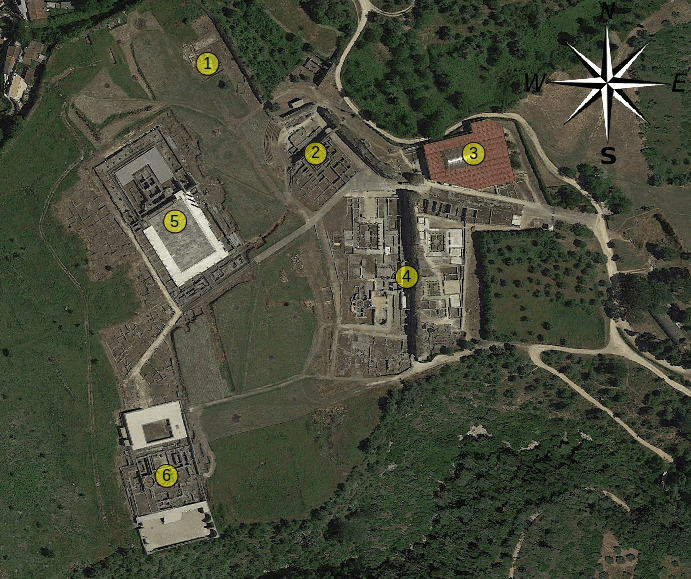 7: Conimbriga seems to be criss-cross oriented, but all major buildings have one thing in common – a counterclockwise orientation and the location of the site is East of our 47.1W line. When we measure and process the orientations of the main buildings, we find the same astonishing truth as with Chichen Itza at the other side of the Atlantic Ocean – the probability for this criss-cross orientation pattern to relate with the proven poles I to V exceeds all expectations. The criss-cross orientation of the buildings at Conimbriga seem to be nothing special. But when we correlate the orientation of the buildings on this site, they correlate with more than 83% with positions the current and former geographic poles. Would that be a coincidence? Geology tells us the geographic pole did not move over the last one million years, which is also one of the highly defended paradigms. But the odds are only 1 to 1.79×1018 that geologists are right about their ideas of a fixed crust. We have proof that Greenland has repeatedly shifted over the North Pole and that is the reason Greenland is (still) covered in ice. It should be clear that it will slowly melt – and why it will melt – due to its still high latitude. This is not difficult to understand once you see it from our point of view. How large are the odds that the orientation of the ruins of Conimbriga correlates with the proven geo poles? That includes our current geographic North pole. We can sort this out mathematically. Fig. 8: We are showing here the graphical presentation of the core of the simulation process. You can distinguish patterns, although it is not clear what you are actually seeing. Computers are very good in pattern recognition when they are properly programmed for a specific job. We built a special simulator to simulate the probability for independent patterns to match onto each other. That is how we know that Conimbriga follows the pattern of a shifting crust with very high certainty. First of all, and that is something archaeologists have overlooked consistently, the chances for an absolute absence of a clockwise orientation are: 0.56 = 0.0156 ≡ 1.56%. The buildings labeled as “4” in Fig.7 show there was a clear notion of a cardinal system because these structures were oriented to our current North Pole, Pole I. One could argue that this is still something coincidental and there is indeed an element of doubt. One could argue that a criss-cross orientation pattern occurs in virtually all urban areas, and that is true. On the other hand, the odds for two independent mathematical patterns to correlate with each other are very low, and that is true as well. That is why we built a specialized simulation model for the specific situation of Conimbriga. We ran 500,000 simulations for this specific set of 6 orientations that we see on the site of Conimbriga. Buildings 1 and 5 (Pole IV) and buildings 3 and 6 (Pole II) correlate with each other because they are similarly oriented and are thus probably built during the same era. Making building orientations dependent on each other in this kind of simulations suppresses the probabilities and so making it more unlikely that we are right in our assertions. Nevertheless, we found a probability of 0.0102% for Conimbriga’s orientation pattern to match coincidentally onto the Poles I to IV. In other words, we are for 99.9898% certain that Conimbriga’s age spans a period of more than 240,000 years. We found similar patterns in almost all other ancient structures around the world, like for example at Chichen Itza, Teotihuacan, Stonehenge, Nuraghes, the hundreds of Chinese pyramids, Carnac, the Egyptian temples and pyramids, and the temples of Bagan, hence reinforcing our method every time we apply it to an ancient site with a complicated orientation pattern. It is highly unlikely that the Romans built this settlement. Conimbriga was built by a very ancient lost civilization long before the last ice age. Homo sapiens was clearly present all over the Earth for over many hundreds of thousands of years and their cultures thrived and developed to levels far above ours. But every time when the Earth experienced extinction events, all these ancient cultures were thrown back into survival mode, and that is the image that we have of our ancient ancestors – a species wearing bearskins, using stone tools, while trying to survive. That image may be correct, but it is incomplete because the survivors were the children of a highly advanced civilization that was forced to revert to one of the many so-called stone ages. The same fate is eventually waiting for our present civilization.